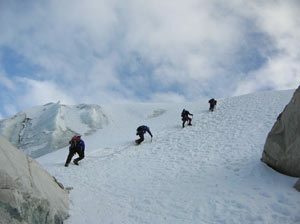 As long time climbers, we approach our business ventures with the same care and focus of a mountain expedition. Extensive research, attention to detail, ambitious goals, efficient problem solving, and good communication guide each Suloff Designs project. We conduct business like we climb: conscientiously, creatively and with great passion. On any climb, teamwork paves the path to success. We also know this to be true in business. At Suloff Designs, we want our clients to be fully involved members of the design team. We shoot for close working relationships to get to know each client and fully understand their needs. We also know that our success depends on our technical skills and our ability to make obstacles into opportunities. Whatever challenge presents itself, we strive to have the necessary tools in hand to rise to the occasion. We want to be the best we can be, and a strong dedication to staying current and not falling behind on industry trends helps us stay in top form. In closing, we believe that the biggest mountain does not always offer the best climb. We are a small business and we embrace all the advantages of being small, especially the individual attention we are able to give our clients. Although we are not a giant, we always think big, and we consistently produce big results. Ideally, each adventure ends with a sense of satisfaction and memories of a good experience. We shoot for this end result with our clients, and our greatest reward is watching their businesses soar to new heights as a result of our work.